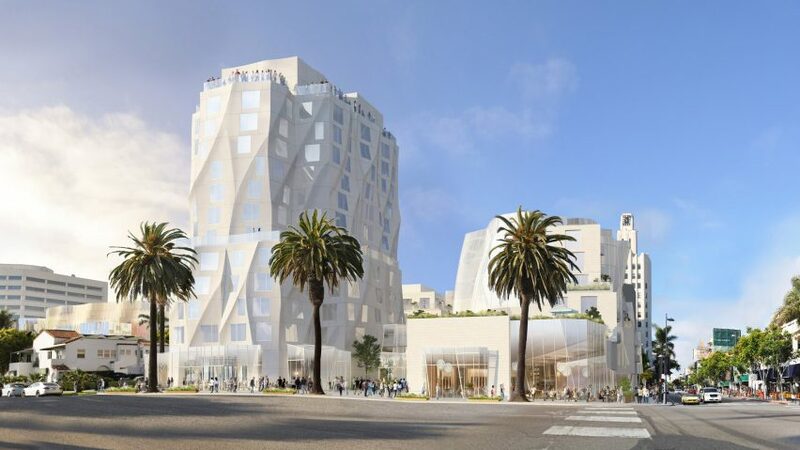 A proposed complex in Santa Monica by Frank Gehry has been updated by the locally based architect to include a lower rippled tower, along with more affordable housing options and pedestrian areas. The mixed-use development will incorporate retail, cultural, and residential space across two acres (0.8 hectares) of property along the Californian city's beachfront. The design for Ocean Avenue Project includes a tower, three lower structures, a museum, and two preserved buildings, which are all integrated with walkways and green spaces. Gehry, who lives in Santa Monica, has revealed a number of changes made to the project since it was first proposed in 2013. Notable alterations include the elimination of a condominium block, the reduction of the hotel programme, and a tower height lowered from the original 22-storey proposal. The white tower with ribbon-like facades will now reach roughly 12 storeys, with a smaller amount of commercial space on its ground level. Its lower half will still house a hotel, but with a reduced number of guest rooms — 115 down from 125 – while the condos higher up have been scrapped entirely. The top of the hotel building will still offer a rooftop observatory measuring approximately 5,000 square feet (465 square metres), which will be open to the public. The Ocean Avenue Project has also been revised to include more affordable rental units, with family-based housing options integrated into the residential plans. Three lower structures next to the hotel building will provide long-term housing, with a total of 79 residential apartment units including 19 rent-controlled units and 18 affordable units. Also close to the hotel are two landmarked buildings: a Queen Anne-style structure from 1906, and a Spanish Colonial Revival building from 1926. "The project will preserve, protect and adaptively reuse two landmarked buildings that exist on the site," said the statement from developer Worthe, which is collaborating with investment company M David Paul Associates on the project. A museum building will be positioned behind the pair of older structures, to incorporate them into the overall plan and promote public engagement with historical parts of Santa Monica. Public art will also feature along the public walkways and garden areas. The new museum will measure 40,000 square feet (3,716 square metres), and provide a new outlet for artistic and cultural presentations in the city. The Santa Monica Museum of Art (SMMoA) was based at in the middle of the city, until closing and relocating to Downtown Los Angeles in 2016. The Ocean Avenue Project is sited on the corner of Ocean Avenue and Santa Monica Boulevard, and has access to the promenade and beach across the street. Pedestrian pathways and courtyards have also been redesigned to integrate the development to the surrounding area. It will serve as a terminus for the city's Third Street Promenade, a car-free street and shopping area. "This layout allows porosity and designates approximately 25 per cent of the site area as public open space at the ground level," said the developer's statement. "All street frontages, other than the alley to Second Street, are free from vehicular exit entry points." Santa Monica is an hour drive from Downtown Los Angeles, and known for its tree-lined residences, walkable streets, public pier and beach access. The city's Downtown Community Plan (DCP) includes plans for more housing, green spaces and transit options for the area, while the Metro Line now directly connects LA's Financial District to the Santa Monica pier. "Recent adoption of the Downtown Community Plan [for Santa Monica in July 2017], together with the opening of the Metro Expo Line, makes this an opportune time to develop a project on this site," said a statement. Gehry is working on several projects for the greater Los Angeles area, including another mixed-use development with five distinct buildings along Sunset Strip and a masterplan for the revitalisation of the Los Angeles River, which sparked criticism among local architects and planners. 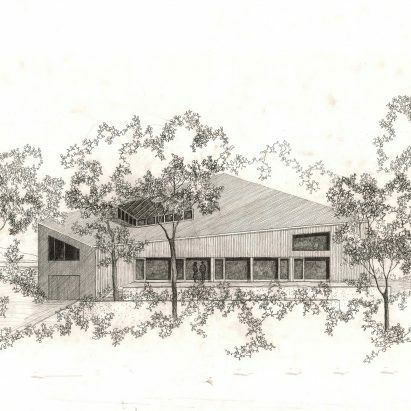 The LA-based Getty Research Institute also acquired an archive of work by Gehry in March 2017.